You really need a car to see the best of the Cotswolds; the easiest is a self-drive hire car to give you the freedom to visit where and when you choose. For visitors who do not want to drive at all, buses cover some areas, but the timetables can vary from hourly, to once a month. Some of the well-known and the most beautiful places have no public transport at all. Walking and taxis are suitable for short distances with private tours by a taxi or private hire car for longer distances and half or whole days out. Some companies have an upper age limit but do not tell you - 70 has been the norm in the past, so it is a good idea to check before booking if you are a Senior. Recently, guests in their 80s rented from Enterprise and some other companies, who said they now have no upper limit. Most British cars are manual (stick shift), so if you want, or need, an automatic make sure you book one in advance, or there may not be one available for you. Some guests are concerned about driving in Britain, and especially in large towns or cities. Hire cars do not have to be collected at airports or cities. Some guests prefer to travel away from the airport by train or coach, and collect their cars from a national hire company in a less congested area, eg Oxford, or Stratford upon Avon where it is even quieter. You can usually collect and return these cars in different locations. If you are very concerned about driving, another possibility is to travel longer distances by train or coach, and hire a car locally, eg Evesham, just for the period you are visiting an area, but you normally have to return the car to the same place. Some companies will meet you at the station or bring the car to you here. 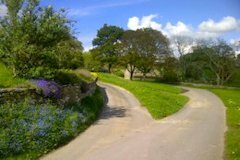 It can be difficult to see some of the more beautiful and quieter parts of the Cotswolds by public transport, and although some of our roads may be narrower than some visitors are used to, the traffic is much reduced. Several of our guests have done this in the past, and felt it worked well. We have details of a couple of local car hire companies if you would like more information. (We’re not on commission!!). If you need to hire for only the weekend, Enterprise (Oxford, Stratford etc) may still have their excellent value special offer- and other companies often have special deals if you carefully search their websites. When you arrive to collect your hire car, some companies may present you with unexpected “optional” insurance to cover excess charges in case of accident or damage. In some cases the insurance payment can be almost as much as the car rental. However, there are insurance policies which you can take out yourself to cover damage or accident excess charges, and the premiums can be a fraction of those “suggested” by the hire companies. We were told about www.worldwideinsure.com/car-hire-insurance.htm and have since found others by searching the internet. We paid £55.00 to cover all cars we hired abroad in one year provided no rental was more than a month. It was very satisfying to tell the hire company we didn’t need their additional insurance, and to make a huge saving. It is now possible to hire Satellite Navigation Systems, along with your hire car, and these are obviously a great help in locating specific places, eg hotels etc. (If you use one, please note that some of them are not very accurate within a mile or so of us.) However, it is also worthwhile buying a large scale road atlas which cost up to about £7.00. Satellite Navigation takes you to a location, but gives you no idea of the places you are passing nearby - eg that we are close to Stratford upon Avon, and within easy reach of Oxford. 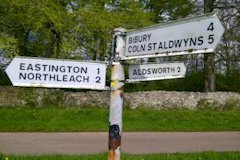 A road atlas shows all our minor roads, and these are the ones you will need if you want to find our beautiful villages and countryside. This kind of map can usually be purchased at filling (gas) stations, and we try to keep a small supply here. 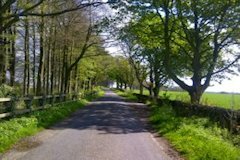 Many visitors miss the best of the countryside because they stay on the main roads, and even if their SatNavs take them through the villages and small roads, they often have no idea where they are unless they have a map. We also have large scale local maps which we have marked with suggested routes and places to visit – you can borrow these whilst you are with us.